a waistband with belt loops. 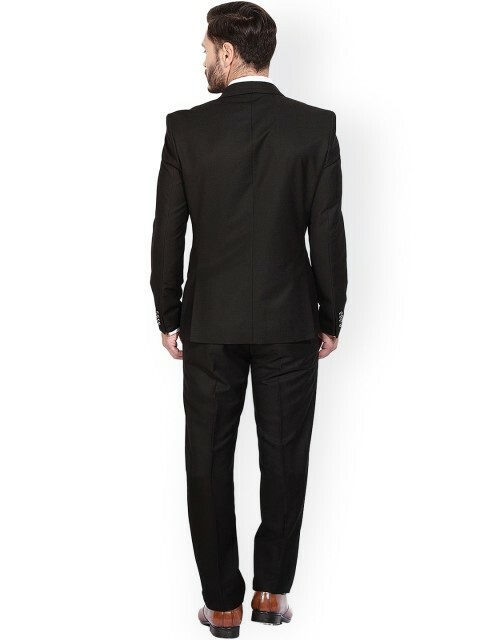 This black suit by Blackberrys includes trousers and a blazer. While the trousers have multiple pockets, zip fly and button closure, the blazer features shawl collar, twin side pockets and a single button closure. Tailored in slim fit from terry rayon fabric for a luxe feel, this suit will go well with a white shirt and dress shoes. Disclaimer : Product colour may slightly vary due to photographic lighting sources or your monitor settings. Material Care : 84% terylene, 16% rayon Dry-clean Shopsyour Guarantee : Shop with confidence as all payments are 100% secure.